Cars, trucks, buses, bikes and pedestrians are all crossing the tracks regularly now. 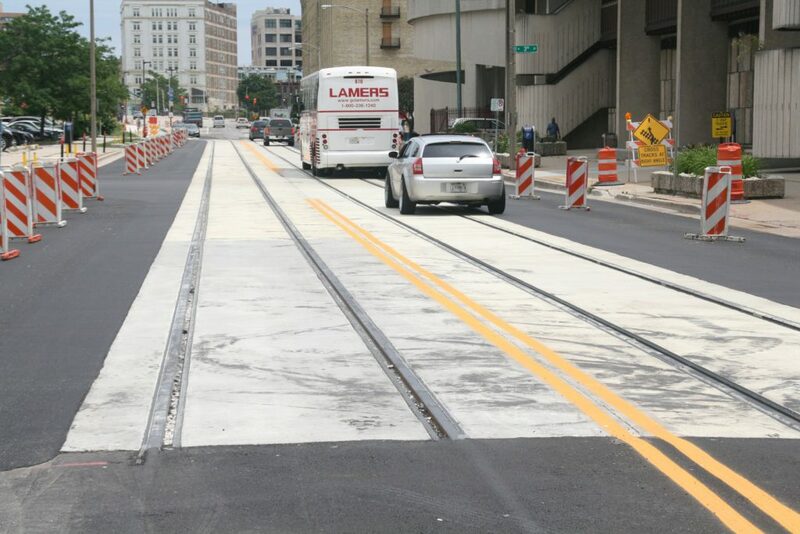 Summerfest festival traffic is putting the newly installed streetcar track on W. St. Paul Ave. through the paces. For the first time drivers are able to drive on the recently installed tracks. In order to accommodate festival traffic, crews have cleared off the stretch of W. St. Paul Ave. they’ve occupied since early April. Vehicles are now cruising along atop the tracks. 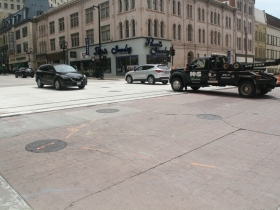 Vehicles and pedestrians are also crossing the track on E. Wisconsin Ave. at N. Broadway where a one-week closure resulted in a finished intersection. Cyclists are also getting their first chance to interact with the tracks, and our photos capture one cyclist correctly crossing the rails. Drivers and cyclists alike will certainly notice that the finished section includes a repaved street free of potholes. Work is underway at a number of other spots along the route as well. 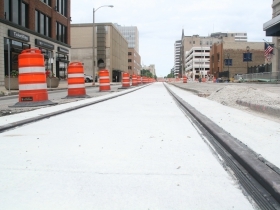 Concrete is being poured on a stretch of track on N. Broadway from E. Michigan St. to N. Wells St. Crews are working along E. Ogden Ave. to install the mounts for the overhead catenary system. 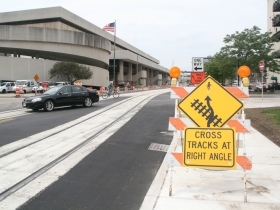 N. Jackson St. from E. Ogden Ave. to E. Kilbourn Ave. is also seeing a ramp-up in activity, including the recent removal of former streetcar rails that were in the way of the new guideway. 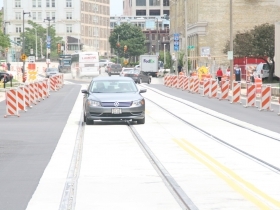 The removal of former streetcar infrastructure was expected as downtown Milwaukee streets are effectively a layer cake of every prior iteration of the street stacked one on top of another. The trench that was recently dug on N. Jackson St. has revealed everything from old streetcar rails to remainders of wood and Cream City brick. 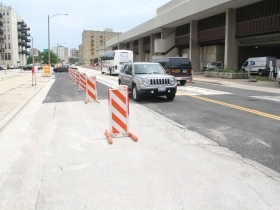 According to a status update from the project team, work on the supports for the overhead wire system will begin on July 5th on N. Milwaukee St. Portions of the street will be reduced to one lane in each direction with parking temporarily restricted in certain areas. Construction of the system is being led by Kiewet Infrastructure. The announcement of the firm that will operate the streetcar for the city is expected this summer. As of mid-May a total of $30.5 million had been spent on the nearly $128 million project. Extensive detail on the project’s costs, construction process and timeline can be found in our past coverage linked at the bottom of this article. Kiewet expects to complete construction on the first phase of the streetcar in the second quarter of 2018 when testing of it would commence. Construction on the lakefront spur is expected to begin at that time. 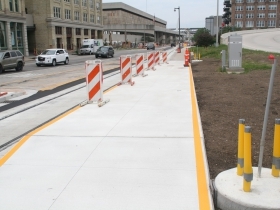 Public operation on the initial route connecting the Milwaukee Intermodal Station and Westown with the Historic Third Ward, East Town and the Lower East Side is scheduled to begin in the fall of 2018 following route testing. The lakefront line extension is expected to begin operating in the third quarter of 2019. The system, including the lakefront line, is estimated to cost $127.64 million, of which $69.1 million comes from federal grants. Utility work is wrapping up along the initial route. That work, which has been underway for over a year, has moved block by block throughout the route. We Energies and other utilities are hiring their own crews for that work and are being reimbursed by the city. So what’s next?Cost overruns once it is up and running?More cuts to the Milwaukee Police department and fire departments?Anyone who thinks Milwaukee has a well staffed Police Department is naive!Take a look at all the cars driving around with no tags!And don’t forget those running red lights and blowing through them!It seems like the Mayor is primarily focused on downtown.Has he ever driven his car on the southwest side of down 60th street between Forest Home and KK Avenue?A great to damage your front end!I live on the southwest side and am planning to move out of Milwaukee in less than a year from now! Steve, I fully agree with you. Barrett is totally focused on Downtown/Bay View/Walker’s Point and doesn’t give a shite about the rest of the city. I live on the central far west side a half block away from Tosa. We have a wonderful alderman who listens to his constituants and has tried very hard to do good, so unlike the stonewalling we get from Barrett. My neighborhood is constantly plagued by drug dealing, burglaries, robberies, and car thefts. The front line officers of the MPD are spread so few and far between. Many of my neighbors work for the City. We all agree we’re in this bag of crap together. And who’s holding the bag? Barrett. We’d so love to get him out of office, but he’s got a huge war chest. Seems to be the way of WI politics since the 2000s. Same here with moving out of Milwaukee. I’ve lived here my entire 58 years and love the city, but have simply had enough. Not to mention I’m unable to afford living here anymore. With all the parking spaces being eliminated by the trolley where will all the disabled park? It seems 1 in 5 vehicles downtown has an impaired tag. We sure have a lot of disabled working downtown. In 2011, the City said there were 7,750 on-street parking spaces and another 67,000 public off-street spaces all within a quarter-mile of the tracks. Of these 75,000 public spaces, the streetcar was to remove only 121, so I don’t see a big problem. Thank you Barrett, for the best invention of the 19th Century, coming back to us in the 21st Century. Impressive Stuff – well thought out, and awesome that we are getting this for such a great deal!!! This is going to save me so much time so I don’t have to water my horse when I make my simple trip to the woodworking shop. The troll’s heart bleeds for the disabled. As Tom said there is no problem here so make up another fake problem Troll Jason. Still with the same jokes anti-transit loons? Years later and you still don’t have any new material? Ben I have some land near Florence for sale. Are you interested? You can build a cabin and only eat what you kill. Seems like that’s where you belong. In an age where we are so close to fully autonomous, computer-guided transportation, the idea that a city would invest this much money in fixed-endpoint infrastructure is nothing short of mind-boggling. Enjoy, Milwaukee… you elected it. That goes to show how ignorant right-wingers are. People especially younger generations want mass transit. The city’s with the healthiest economies have good mass transit. It brings businesses and jobs and housing. Read a non-conservative publication and learn something. Autonomous vehicle technology (which is probably still decades away) will in fact mean the end of common car ownership and will usher in a new age of transit, well-suited for infrastructure like the streetcar. If you can eliminate the expense of the bus or train driver, many large transit systems become profitable, especially electric rail because of low fuel costs and low-maintenance, long-lifespan vehicles. Are you aware of what a flop self-driving Uber cars were in San Francisco? They repeatedly blew through red lights! Their technology requires that each signal be mapped, and Uber forgot to map at least 6 of them (resulting in the red-light-running). Since signals are added all the time, what are the chances of EVER getting all of them mapped at once? Vincent: While it may be true in most cities with light rail, who experienced a boom in jobs and housing along the routes, I don’t think that is a fair argument for Milwaukee – a City that has been losing population (and businesses) for the last 50 years. The cities you are referring to basically already had population increases along with jobs. Currently, Milwaukee’s population decline needs a lot more than a streetcar. It needs leadership that can deliver results for jobs. It needs local leadership that can provide equal housing opportunities. The City needs local leadership that can combat crime, and change the City’s image on a national level so that Employers will move their employees to the City. Right now, Milwaukee is seen as a poor, population dwindling, and racist City by its peers nationally. While I am in favor of mass transit, I am in favor of all modes of transit benefiting all citizens of the City. I just don’t see this streetcar doing that at the moment. I also do not buy into the argument that it will spur lines to ‘eventually’ benefit the rest of the city. Because again, the City needs much more than just a streetcar to lure new residents. To Ben: My parents grew up taking the streetcars in the 40’s and 50’s and that was because the city buses just didn’t exist. The difference now is, Milwaukee is a much smaller City in population because of the suburbs. And at that time, the City had much better leadership. It is also worth mentioning, the City had one of the most efficient transit systems in the country where its larger peers were seeking advice from local officials for their transit systems. Not Pertinent: I got a great idea – let’s increase the minimum wage in Milwaukee to $15.00 an hour – that should help solve everything….or so has been recommended by many. 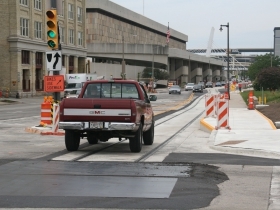 The 1950’s are well beyond my years, but the last tracked trolley in Milwaukee was used in 1958. 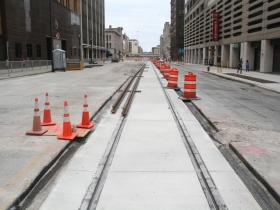 Milwaukee had an incredible infrastructure for trolley’s, light rail, speedrail, etc. Milwaukee rails went from Milwaukee to Kenosha to Chicago, Milwaukee to Cedarburg to Sheboygan, Milwaukee to Waukesha. The history is pretty interesting, but ultimately, it is history, and there is a reason these businesses are no longer in business. The City of Milwaukee could do sooooo much more with this money. I understand the historical and sentimental value of the trolley, I really do. I think it is cool…..but I do not see how this is a smart investment for Milwaukee. I don’t see how the trolley is going to be inspiring for growth, and I can’t fathom how it is going to re-generate funds as compared to the overall cost and annual expenses. Ah yes more simplistic anti-Milwaukee rhetoric from Tennessee. Milwaukee is not seen as nothing but poor and racist. That doesn’t begin to tell the city’s story or the perception that people have of it. That’s just ignorant nonsense. And of course it takes more than mass transit to make a city thrive, and it’s important for mass transit to benefit more than just downtown and neighborhoods bordering downtown. But I think this is something the city needs and that it will benefit more than just those living and working downtown. Time will tell. It’s working better than expected in Kansas City and it can work in Milwaukee too. You really need to either stick to Nashville or stop with the obtuse labeling of a city that is far more than what you claim it is. What we find in most cities from NYC to Denver and from Los Angeles to Milwaukee is a remarkable, renewed interest in living and working in cities–and especially downtown–after decades of flight (via automobile) to the suburbs. Of course, there are mitigating factors to this phenomenon (crime, schools, etc.) and these cannot be denied. Nonetheless, for anyone like me who was born in the 60s and grew up in the 70s an 80s, it is nothing less than amazing that the once ubiquitous suburban McMansion is among the least desirable home styles today, while vacancy rates at suburban shopping malls skyrocket. These malls are giving way to open-air “lifestyle centers” that emulate key elements of the urban experience. the developers of these projects know where their bread is buttered as even suburbanites want an urban-ish experience, albeit with a crap-load of parking. I agree with some here who rightly argue that attention must be paid to the entire City of Milwaukee, and not just it’s downtown. While I have not lived in Milwaukee for 30 years, I sincerely hope that the City can find ways to deal with its systemic challenges. I don’t know Mayor Barrett well enough to say that he is the right person for the job. I have heard some say he lacks vision. That said, if I were mayor, one thing I would focus on is expanding my tax base. And, if I saw that many kinds of people wanted to live and work downtown, you bet I’d ride that wave. There has been proof of concept in a number of cities and data for a couple that streetcars (along with other kinds of mass transit like BRT) attract and support both commercial and residential development. And, as counter-intuitive as it may be for a suburbanite, its is notable that the most desirable cities aren’t those with the most available parking or the shortest rush hours, but the exact opposite! People want to be in cities because of the convenience it can afford them and to live a particular lifestyle. Is it for everyone? Nope. Vincent, calm down. None of what I said was an attack on you as a person. If simplistic means reminding you and others of Milwaukee’s data (numbers do not lie) in hopes that it engages the community to make changes, then so be it. I live in both Milwaukee and Nashville – so I stick to both. But, since I was born and raised in Milwaukee by immigrants, I also have a lot to say about the City – and a lot of anecdotal experience. I am not providing the ‘obtuse’ labeling of the City. The City of Milwaukee is doing that all on its own, by itself. Or, it isn’t doing anything to the contrary, either. Also, can you provide numbers to support your argument? Kansas City has not been in a steady decline of population, and jobs, over the last 50 years like Milwaukee. So I don’t feel like that is a fair comparison. I would support your opinions 100% if they related to tangible job-creating ideas, or community-based changing ideas, instead of sounding like some spoiled Millennial who wants nothing else but that shiny new streetcar. I’ll remind you that I am fully supportive of a transit system that provides transit to all of its citizens. I grew up taking buses everywhere because my parents could not afford to buy me a car. Also, what are you doing in your community on a local level to make changes where you live? Because it appears you only enjoy these comment boards for arguments. And you provide no real tangible results or solutions to your comments. Ben: I support the Streetcar with or without its historical significance. What I do not support is how we can ignore the more pertinent issues facing the community while a bunch of spoiled folks want to be like Denver, Portland, or as Vincent claims, Kansas City. I still pay significant tax dollars in the City, and I don’t feel like we should have the Cadillac before we can pay for the Ford. PS – I’m a Liberal, 1st generation, Democrat. The streetcar IS triggering a huge construction boom: at least 4 new hotels (Marriott, Hilton Garden Inn, Springhill Suites, Homewood Suites and perhaps a Cambria Suites), at least 3 new high-rises (the new BMO building and the 2 NML towers), a new home for the Symphony, and lots of new apartments. All were announced after the streetcar route was finalized in 2011 and all are within a block or so of the eventual tracks. Even the moribund Grand Avenue mall shows life, increasing in value 49% within 14 months (sold for $16.5 million in October 2014; resold for $24.6 million in December 2015). The fact that this development was all announced shortly after the streetcar was approved is not a coincidence. Similar development booms have also happened in at least 6 of the other 8 US cities that opened similar streetcars since 2000. You are very self-righteous. Kudos to your music idea. Sounds wonderful. I don’t think and never said Milwaukee has no problems but you paint in broad strokes and denigrate it with no nuance. That is indeed simplistic and obtuse regardless of your political and extracurricular credentials. I don’t need to prove anything but I am a longtime educator in Milwaukee and volunteer for some nonprofit as well. I sleep well at night. Also I preferred light rail and am still bummed about Walker killing it but I believe the streetcar can be successful and am pulling for it. Also I am not a Millennial. Too old to be part of that generation. Companies are already flocking downtown. That isn’t enough and I too want to see the entire city thrive not just downtown and the Third Ward. It’s also amusing to hear the “Barrett and developers need to focus more on the rest of the city!” mantra over and over. Then the second something bigger than a two story house is proposed anywhere the entire area rises in protest as if they were building a landfill and the developer doesn’t build. Not shocking that nothing happens anywhere else, the residents don’t want it, especially the south side. The north side wants more jobs, higher wages and easier public transit to jobs. The south side generally wants to keep everyone and everything out of their bubble. Either way, can’t stop the streetcar, it’ll be expanded. Don’t like it? Move out of the city and you’ll be fine. WashCountyRepub should really find something else to occupy his time, like the heroin epidemic that’s consuming the kids up there. Vince, companies are coming downtown because their workers want to live downtown. You provide no answers for the rest of the city. We need welders, electricians and plumber, maybe MPS could spare a little time away from “social justice” and provide “blue collar skills” to city youth. Also, we should be the San Fran of the Midwest, why does Tom Barrett not do more to make this a gay friendly city. Provide tax credits and small business loans to the gay community. Every city in America that has a large gay presences succeeds. Why are we not there yet. The Gay community brings higher salaries, spend more then straight people, pay more in taxes, provide higher home values and use very little government programs such as early education. Good one Troll. Take a shot at Barrett and pretend like you care about gay people when we all know how white supremacists feel about the gay community. • Street maintenance. 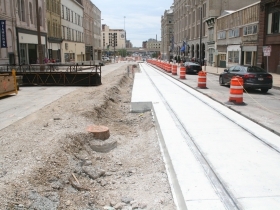 Milwaukee required the private streetcar company to maintain (pave, plow, sweep) all streets with streetcar tracks. If they converted to buses, the taxpayers would pick up the street maintenance costs. • Street surfaces. 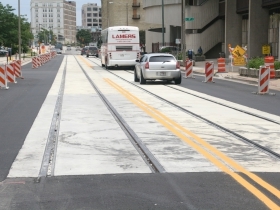 The old streetcar tracks were laid on wooden cross-ties and covered with loose bricks or cobblestones (so they could replace rotted out cross-ties). People hated driving on cobblestones and pedestrians often tripped on their uneven surface. • Comparative power costs. Diesel was cheaper than electricity; now it’s the other way around. • Air pollution. Nobody cared about air pollution back then; smog was actually seen as a sign of economic progress. The words “environment” and “ecology” were unknown. Today, people want to reduce air pollution. • Labor costs. Many old streetcars required 2 crew members: a driver and a separate conductor (to collect fares). Buses and modern streetcars only need a driver. • Trolleys instead of pantographs. The old streetcars used “trolleys”—black poles rising from the roof touching the overhead wire. Trolleys were prone to slip off the wire, stopping the streetcar (and paralyzing other traffic). Modern streetcars use “pantographs” instead of trolleys. Pantographs are better because they cannot slip off the wire. • No battery power. If the power failed, the streetcar just stopped dead in its tracks until the power returned. This messed up traffic. Modern streetcars have more than enough battery power to return to the garage. And should a streetcar become disabled, each modern streetcar is powerful enough to push or pull another (using hidden couplers) back to the garage. • Traffic congestion. Milwaukee had very few streets with more than one lane in each direction, and streetcars ran on almost every major street, delaying cars. Today most major streets have at least 4 lanes and there are also freeways. • Bumpy, noisy ride. Track construction technology has improved DRAMATICALLY in the last 100 years; the difference in ride quality is comparable to comparing a gravel road to asphalt. The old tracks used 40-foot rails, bolted together. But most joints had slight height differences (worsened over time by the slowly rotting wooden cross-ties supporting them). 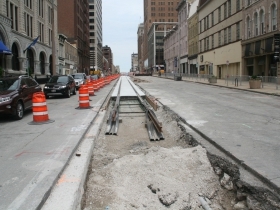 When a streetcar passed over an un-even joint, passengers felt a slight jolt and heard a click. Because there are 2 rails, there was a new joint every 20 feet. And because there were 4 axles, passengers felt a bump every 5 feet on average. This just isn’t the case any more. 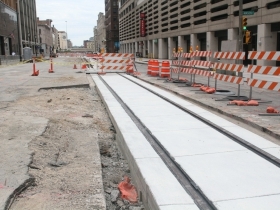 Milwaukee’s new streetcar uses 320-foot rails laid on re-enforced concrete. That, combined with modern suspension systems, makes for an incredibly smooth ride. It’s exhausting to read the same hackneyed, negative, simplistic comments from suburbanites and conservatives. The downtown is the economic and cultural engine for the entire metro area and, frankly, also plays an outsized role for other hinterland parts of the state, too. So yes, it needs more attention and infrastructure–because it *does* more in the first place. It doesn’t have just a single use, like many residential zones. Lots of people work there, lots of people live there, lots of people pursue entertainment there, lots of visitors stay there, and there are many combinations of those uses with a density not seen anywhere else in the state except arguably Madison. Also, remember that economic activity in this zone generates tax revenue that is spent elsewhere in the state. Remember that the exurban and rural areas are net takers (because they need lots of services but don’t generate enough revenue to support themselves), not the other way around. This is despite what they want to believe. Let’s also dismiss this simplistic idea that, because a technology (fixed rail) was used in the past that it is outdated. They’re not more outdated than bikes, which are very popular as long as the conditions that make them popular aren’t engineered away. If you bother to learn your history, you see that the reason old school streetcars declined was because of the cabal of car-related and highway-building industries that lobbied for suburban sprawl development patterns, even though these are full of negative economic and social externalities. But please don’t let the full picture get in the way of your narrative. Anyway, since suburbanites refused time and time again to work with the city on any kind of comprehensive regional transit system (like what Minneapolis has), well, at least the city is doing what it can within its borders. The only people moving out of the suburbs and back into the city are upper middle class empty nesters while the solid middle class moves out to the suburbs to send their kids to better schools leaving a growing affluent class downtown,Walker’s Point,Bay View,The Third Ward and Brewers Hill with the rest of the city seeing a growing underclass unable to escape deteriorating neighborhoods such as not only the Central City but the Northwest side (Has anyone driven Brown Deer Road between 68th and 91st?Lots of empty commercial buildings) and near south side.I live on the southwest side south of the West Allis city limits which has very low crime but even that is changing.I see more and more homes going up for sale because Milwaukee has been ranked 5th most dangerous city in America and ranked 3rd in Carjackings and Auto Thefts and 2nd poorest city behind Detroit.Under Mayor Barrett,crime has more than doubled and is it any wonder why people are moving out to the suburbs?I love Milwaukee but as long as we got Judges handing down soft sentences for repeat offenders,I am preparing to move out. Tom D, great rundown of some of the biggest technological changes in streetcars from “then” till now. I hadn’t seen a good list like that before. People didn’t just start moving to the suburbs since Barrett became mayor. People like Steve obsess over the negative and completely ignore the positive. No one says there isn’t work to be done. No one says we should only focus on downtown and near-downtown neighborhoods. Should there be no development in any neighborhood until judges hand out sentences you approve of? Or until there are less empty buildings on Brown Deer Road? We need more middle class jobs in the city, no doubt. Where are your solutions Steve? Milwaukee’s population declined under Mayors Maier and Norquist but has remained essentially flat under Mayor Barrett. Violent crime rates have bounced around but the general trend is that it increased in the 1980s, was flat in the 1990s, and has increased in the 2000s and 2010s. Looking at just the homicide rate, it increased significantly in the 1980s, fell slowly in the 1990s and 2000s, and has risen in the 2010s. Paul, your point on Suburbanites not working with the City of Milwaukee. Where is the Buck’s arena and who is paying for it? Second, Kenosha wanted a Casino who was the biggest opponent of that? How about when Waukesha was interested in acquiring water from Lake Michigan. Tom Barrett again said, “F@ck you”. The Trolley is here and we right wingers get it. The question is how much will it be a drain on hopefully only the city of Milwaukee over the next ten years and when will Barrett demand the County pay into this money pit. If my local history serves me correctly, wasn’t the funding for this project originally slated to go to the KRM line to connect Milwaukee to Racine and Kenosha? But it was the conservative suburbanites that voted it down. So instead of getting a useful line of transportation connecting Milwaukee to two southern burbs, and ultimately Chicago, you get a 3 mile loop in the middle of the city? Seems like a shi**y deal for everybody except tourists, and downtown business owners. @Toni Toni Toni – That’s incorrect. The money was allocated well in advance of that project for a larger system that was ultimately rejected by suburban legislators. It was then split a couple times (with the feds taking some back, some going to buy new buses and some going to the 6th Street bridge and Marquette Interchange) and ultimately the city was able to advance this project. Looks great, will be perfect for my commute.